2015 Iron Dog update: Team 4 has left the official restart in Big Lake, Alaska and is racing towards a successful finish in Fairbanks. This years race will provide some difficult challenges for riders along the trail. The lack of snow and open water areas, will force riders to slow down and take the necessary precautions to stay in the race. Riders in the Trail class division have already reported bare tundra with no snow from Rohn to Nikolai. 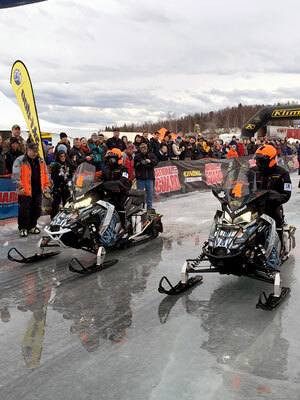 These no snow conditions have already taken a toll on sleds with broken shocks, damaged chain cases and overheating heating.